Days are getting shorter, and temperatures will soon be getting cooler. It’s adventure season and whether it’s backpacking, peak-bagging or sitting around the campfire with your crew, POW wants to power your adventures with solar. For a limited time only, become a POW member with a $20 or more contribution, and they’ll send you a packable solar-powered Luci Lantern to light your way this fall. Luci Lights offer an easy way to light up the night on your adventures with up to twelve hours of battery life. We have limited quantities so don’t miss out on your opportunity to support POW and solar power your adventures this fall. Please click here to contribute $20 or more and get yours today. Remember, your contribution and membership directly helps in funding POW's advocacy work. As a member, you’ll receive the tools, education and opportunities needed to take action and become a part of this movement with us, as well as invites to VIP events and athlete meet-ups, discounts on POW gear, and more. 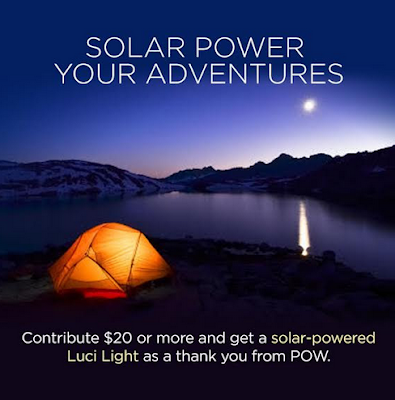 Please click here to pitch in $20 or more and secure your POW membership and Luci Light today.